home is as simple as flipping a switch on the AC unit. Cooling the outside of a home is a bit trickier. One option is to use a large, bulky evaporation cooler, but these units are expensive and are energy hogs. 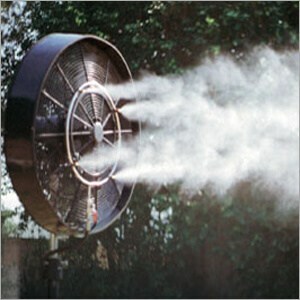 Outdoor misting fans are a better choice because they are lightweight, economical and effective. These devices work just like any other fan except that they are equipped with special spray nozzles that release mist in front of the air flow. The mist travels through the air, coming in contact with people nearby. As the water travels through the air at high speed, it drops in temperature, cooling the skin on contact. The secret behind the cooling power of these fans is in the spray nozzles. Small spray nozzles attached to the front of the fan emit mist which is propelled by the air current. These fans have a leader hose which connects directly with your garden hose. Upon turning on the hose pressure, mist will start coming out the fan. The more nozzles the fan has, the more mist will come out. The intensity of the spray can be controlled by adjusting the water pressure at your spigot. Many of these fans have the option of turning off the spray feature while the fan is operating, sending out only air. The amount of cooling that a fan can achieve is measured in BTU's (British Thermal Unit). A higher rating reflects a greater effectiveness at cooling. If you already have an outdoor fan, you are in luck. There are spray kits available that can convert your regular fan into an outdoor misting fan in minutes. The kit consists of several clip-on nozzles and a leader hose. Some fans are better at cooling than others. Extra features play a large role in this. For example, a large diameter fan blade will be able to cycle a larger volume of air than a smaller one. If you plan on cooling a large area, a large diameter blade is a must. Also, some models have a rotating fan head which allows the air current to be directed across a wide area. Different speed settings allow for complete control of the air speed, adapting to different temperatures throughout the day. For floor models, an adjustable height stand is a must. With an adjustable stand, the fan can change heights to suit different applications. For example, a gardener working on the ground can set it to a low position. 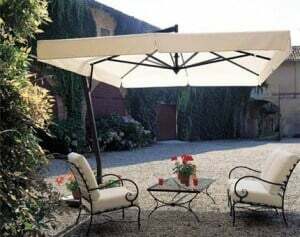 People sitting on a tall bistro set can set the stand to a higher position. For large area coverage, a ceiling or wall mount is recommended. These fans mount to a wall or ceiling to achieve a high vantage point. In this position, complete coverage can be assured.